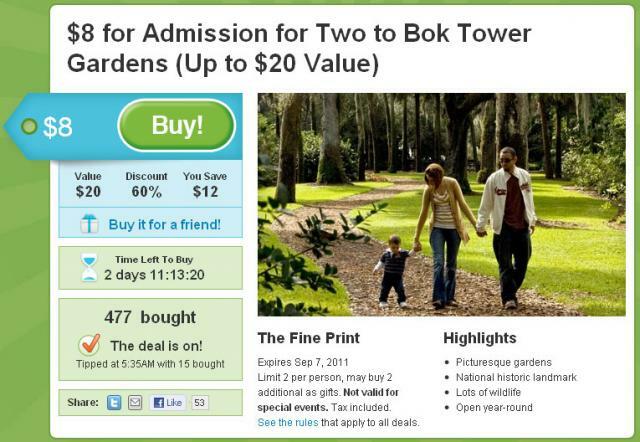 Bok Tower Gardens Groupon! Another Great @GrouponTampa Deal! Hey folks! Jerm back here again with yet another update on a great deal that you should take advantage of! At Bok Tower Gardens, experience one of America&apos;s finest gardens and nature preserves surrounding a 205-foot sculpted marble carillon tower with daily concerts and Mediterranean style mansion. From art exhibits, to children&apos;s events, live Music at Pinewood, special Carillon Concerts, and even workshops, you and your family can do it all at Bok Tower Gardens! Today, thanks in large part to the fine folks at Groupon Tampa, you can enjoy all the beauty of Bok Tower Gardens with $8 for admission for two to Bok Tower Gardens, which is normally up to a $20 value (Both admission passes must be redeemed on the same day)! Now of course you know, this great deal won&apos;t last long, so whether you are keeping it for yourself, or gifting it to friends and/or family members, hurry up and take advantage of it before the deal expires on Monday! Now for those of you that would like to learn more about the Groupon process, check out the site at the Groupon Works site. If you or your business are located here in Tampa Bay and interested to learn more about makign Groupon work for you, just contact our awesoem local Groupon rep Jessica Dwyer at jdwyer@groupon.com! That&apos;s all for now folks, but stay tuned in for more updates on deals and things to do in Tampa Bay!